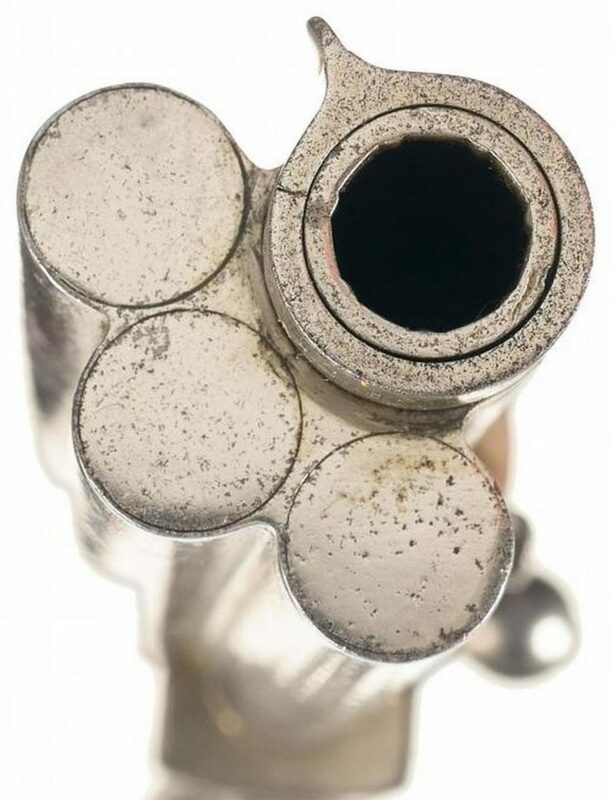 This unusual, bolt-action, manually-repeating pistol has three tube magazines running along the barrel. We don’t know who made this weapon, nor when or where. Given its general aesthetic and mode of operation, it likely dates from the 1880s. The prototype, which sold at auction in 2010, is in-the-white and has a walnut grip. The barrel is 6.5 inches long. It’s listed as being .45 caliber, potentially meaning it’s a .45-long-Colt. It operates by a simple bolt action. The auction described the method of feeding as “gravity fed,” but it’s unclear whether the tube magazines include a spring and follower, or if the shooter simply tipped up the gun after each shot. The magazines lock in place by way of a knurled pin on the left side that extends into a recoil shield in the receiver. They load through a channel on top of the receiver, which also acts as a rear-sight cutout. In short, this gun is strange. The bolt connects to the barrel, which moves forward to open the breech and allow a round to enter by way of a cartridge-lifter. Moving the bolt and barrel back then feeds the round into the chamber. The cartridge lifter drops back down and picks up the next round. There’s a space for an extractor, which is no longer present, on the right side of the receiver. The trigger is unguarded and has a housing that projects from the grip and receiver. The bolt handle appears to be hinged, probably for disassembly. The prototype appears to be well-made, but as it lacks markings, it may never be possible to track its origins.